CustomShirts approached No-Refresh to get a custom t-shirt design application developed and integrated in their website. They urged to have a tool that is easy to use and can offer customized shirts online when accessed by their end users. We offer them online t-shirt design software program in accordance with their requirements. They can create their favorite shirt with their preferred design, patterns, color and style. 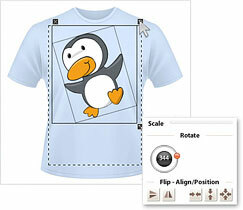 The tool enables them to add text, images, fonts and even logos if they need to use the shirts for promotion purpose. Making personalized t-shirts no more remains a hectic task with the access of their t-shirt designing application. "Words will fall short in the praise of No-Refresh as it is a perfect conjunction of talented team who is blessed with the ability to develop great custom t-shirt design tool. It feels proud to share that we are following a voluminous business with the support of its skilled squad." CustomShirts are actively engaged in the business of creating, printing and shipping of t-shirts. This leading company provides its end users a platform where they can customize t-shirts by using its online custom t-shirt designer tool. Here, they can personalize everything from shirts to custom hoodies, baby clothing, hats, bags, aprons and organic products. CustomShirts needed a custom t-shirt design application to be developed and integrated in their website that had to be simple-to-use. The tool should be capable to provide end users the facility to customize or personalize shirts online. No-Refresh took over the development work of online custom t-shirt design application software. Customshirts.com teamed up with No-Refresh skilled developers which serve up their requirement of powerful t-shirt design software that capture visitors' attention and motivate them to engage in customization of shirts online. Custom shirts choose online custom t-shirt designer tool as its solution and No-Refresh as its partner. With the solution developed by No-Refresh, the end users of Custom shirts able to create highly customized t-shirts without any hassle more quickly and efficiently. No-Refresh developed custom t-shirt designer tool application and integrated the software with their website. This advanced tool allowed their website end users to customize t-shirts. The company also handled the complete designing and development part of customshirts.com website. The custom t-shirt designer tool made customshirts.com highly successful in the online market. At the same time, they recognized that this sophisticated online design software brings them high recognition among targeted set of visitors. This tool generates higher click-through rate (CTR) and conversion rates for overall website which convincingly resulting in increased revenue into the profitable category for CustomShirts. Increase in the website traffic. Ongoing increases in conversion and sales.